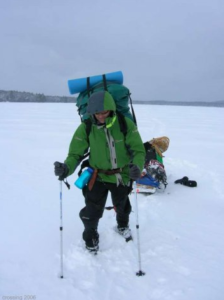 On Sunday January 15, 2006 a Belgian Canadian expedition team started the ‘Algonquin Winter Crossing 2006, on snowshoes at the height of the Canadian winter. 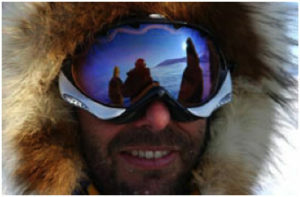 Belgian Polar traveler Dixie Dansercoer was the patron of this expedition. The main challenges for this snowshoe expedition was the thin ice and open water where currents retarded freezing, often accompanied with shoreline cliff sides that required negotiation. Deep soft snow required the breaking of trail ahead of the teams equipment toboggan. Eight km a day was considered a strong day under the snow conditions encountered. Our six-man team pushed and pulled two expedition-style toboggans, each one of about 60 kilos, containing the group stores for the trek. Each member also carried a personal backpack of about 15 kilos. 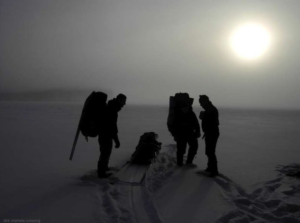 An extra 30 meters of rope was carried, to assist on the high hill accents, also serving as a safety rope for the team when navigating around thin ice, with each team member snap linking to this main line. The team members lived in one large tent with a white gas lantern and white gas stove to provide light, cooking ability and a certain amount of heat. Snowshoes were in almost constant use, a very traditional method of traveling the Algonquin high lands. A tradition passed on from the Algonquin Indian peoples the first humans to inhabit the region. The Crossing team crossed the Algonquin region unsupported and in the traditional style. There is no recorded of the Native peoples ever doing this in the dead of winter but of course they may have at some point. There is certainly no record of such a crossing taking place since the arrival of European influence in the area. 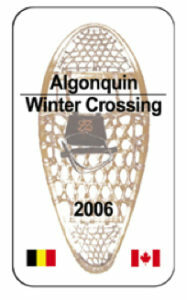 I was happily surprised by Bert Poffé, asking me to be the patron of the “Algonquin Winter Crossing 2006”. 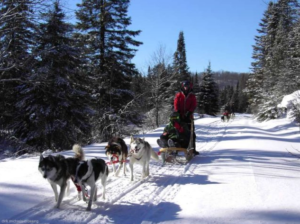 With pleasure I will use all my polar experience to help the team out, achieving this Crossing of the Algonquin Park. I know Bert from a past career where quality and safety go hand in hand. Both skills will now be without any doubt the key for success in this almost arctic atmosphere. It’s a select club, those looking for the secrets of frozen landscapes. It’s all about passion, based on deep respect for mother nature, pure and hard to reach. With enough passion and strength, qualities which I know this Crossing Team certainly has, the North will, step by step, reveal her secrets and her beauty. From experience I know that this kind of event is only possible because of a solid cooperation between the expedition team and so many other people, willing to help out where possible. Apart from reaching their personal goals the expedition team wants to raise funds for “SOS Children’s Villages Canada” and “SOS Kinderdorpen/Villages d’Enfants Belgium”. As you can see for yourself this organisation is a chain reaction of “intensity”, “passion” and “fire”. No doubt they will need some “fire” to withstand the cold environment they are heading for in January 2006.